Preserving mid-century modern architecture has become a hot-button issue around the country as aging icons are becoming old enough to be called historic. 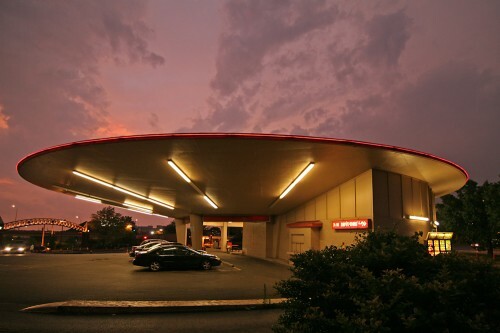 Last year a citizen-led preservation effort to save the unlikely icon in St. Louis, a threatened gas-station-turned-fast-food-restaurant with a distinctive concrete saucer, was launched. Now, it looks like the building will once again become a burrito stand as the developer has confirmed the building will house a Starbucks and a Chipotle. NextSTL has the details. Whatever they believe “aldermanic courtesy” requires, I hope that aldermen take notice of the building’s popularity, particularly among younger residents for whom buildings of the 1950s and 1960s really are old buildings. If aldermen, after mature consideration, approve a plan that allows the demolition of the Del Taco building and the developer subsequently applies for a demolition permit, I will ask Cultural Resources Office director Betsy Bradley to review the permit and make a professional recommendation to the Preservation Board about further action. Meanwhile, the prospect of preserving the unlikely icon is pushing the issue of mid-century-modern preservation to the fore.